In 1969 Stanley Miesegaes was sole financier for a London band as sort of a side project. He became disappointed in their sound, so he offered the keyboardist Rick Davies a chance to divest himself and form a new band, while keeping the financial backing. Ater putting an ad in a newspaper called “Melody Maker,” Davies found a vocalist/bassist, guitarist and drummer. Each of the guys had completely different musical interests and backgrounds, but they hit it off instantly. They flew off to Munich for a series of concerts at a famous club. A 10-minute cover of “All Along The Watchtower” generated some buzz, but nothing huge. Still not having an official name, one of the bandmates discussed his love for a Welsh poet and writer named W.H. Davies—his favorite book by that author being “The Autobiography of a Super-Tramp.” From that day forth, Supertramp was born. With their millionaire connections, the band was able to grab a deal with A&M Records. Still finding their groove, the first couple albums were commercial flops, despite general critical praise. And when Miesegaes died, the band decided to really dig deep and figure out what they were missing. After making lineup changes, they were ready to put out their third album Crime Of The Century in September of 1974. This was a make-or-break album for the band—if it didn’t perform well they were going to get dropped. They headed to a studio owned by The Who and began cranking out tracks. In total, 42 songs were recorded for this album – with only eight making the final cut. It would go on to chart in more than six countries and sell millions of copies. Progressive rock has always been a tricky genre for me. If it’s done well and correctly, it can be like a symphony on a rock album. If they miss the mark, it’s very cheesy and over-produced. 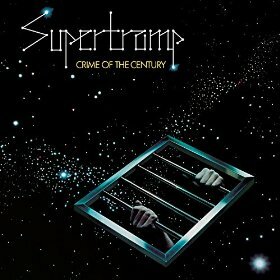 Supertramp finds a really nice balance on this album of being artistic and also being a rock band. Three singles saw major radio play, and they could be featured on virtually any rock band’s album and you wouldn’t think twice. Much of the remainder, however, feels like a theatrical performance on a grand scale. With three songs approaching the 7 minute mark (or more), it toes the line between progressive rock and a Pink Floyd album, but the whole effort comes together well—which may be surprising since the singles are mixed in with the theatrics. It’s really a unique and fun listen. If every band could start with a millionaire in their corner, we might have a lot more music hitting the airwaves than we do today. Thankfully for Supertramp, they found the right mix to make it big and have an influence on the business. If you’ve never been truly introduced to ‘70s synth rock, this is a good one to start with. Well worth $5.